Safflower, aka zafran, dyer's saffron and false saffron, is an annual thistle-like plant in the daisy family native to the Middle East and grown commercially in Europe, Mexico, India and the U.S. The plant produces vibrant yellow to deep red flowers that have been used for centuries to make dyes for textiles. When the plant goes to seed in late summer, the flower heads become shrouded in a downy halo, housing 15 to 20 seeds each. While the seeds yield an edible oil commonly used for cooking, dried safflower flowers are used as an alternative to saffron. It should be noted, however, that although safflower lends lovely color that is comparable to saffron, its flavor is far more subtle. Carthamus tinctorius, aka safflower—not to be confused with saffron which though similar sounding in name, is from an entirely different plant—is a herbaceous, highly branched, thistle-like annual plant of the Asteraceae family. 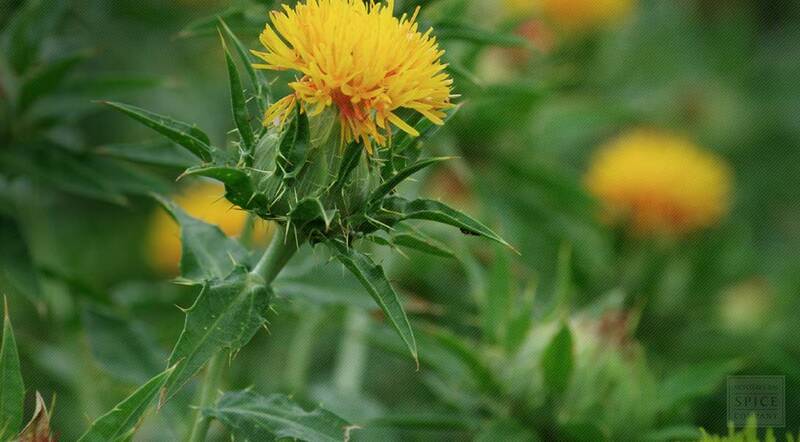 Safflower can reach heights of 1 to 5 feet in height (roughly 30 to 150 cm). Safflower's globular flower heads bloom with red, orange, or yellow flowers. From one to five flower heads will present themselves on branch; usually each flower head will contain from 15 to 20 seeds per head. The plant grows deep taproot which enables it to thrive in its native arid environments having only seasonal rain. 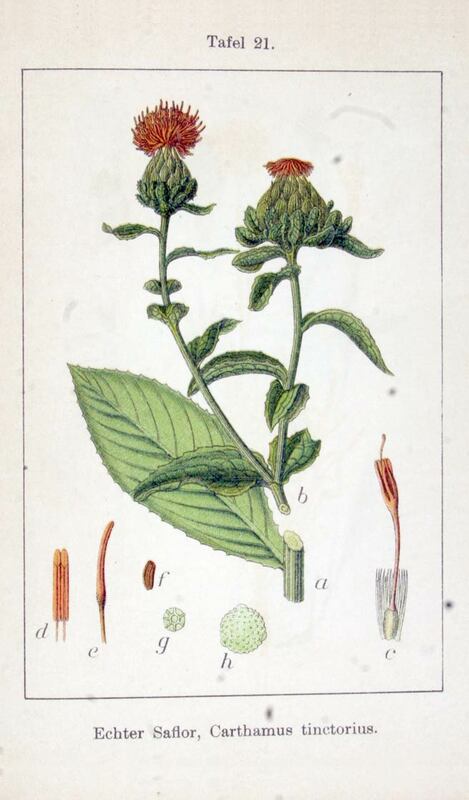 The common name of safflower is traced to the 16th century Dutch saffloer or German safflor from Old French saffleur, from Early Italian saffiore. Safflower is native to India and Iran. It is cultivated in North American and other regions. Safflower is native to a climate with a long dry season and a limited rainy season in full sun. Adapted to poor, dry soils, avoid water-logged soils. Sow seeds in spring in gentle heat in a greenhouse. Germination usually takes place within 2-4 weeks at 15°C. Transplant into individual pots when large enough to handle, plant into the garden in late spring or early summer. The flowers are harvested in the summer and can be used fresh or dried. Store dried safflower and powdered safflower in an airtight container in a cool, dry place. It should not be stored for longer than 12 months. These days, everyone’s watching his or her cholesterol and fat intake. While people once used animal fat to cook their foods, modern wisdom tells us that we need to cook foods in unsaturated fat. As a result, a wide variety of vegetable based oils are on the market. One of the healthiest of those choices is safflower oil. But safflower oil is for more than just cooking. As you’ll see, it has many health benefits you can enjoy. You can use safflower oil for cooking as long as it’s purified. However, you can also use the plant flowers to make a tea.